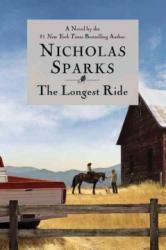 The novel “The Longest Ride” by Nicholas Sparks unravels two beautiful romance stories. The two stories are more different than alike but each love story have its own unique characteristics. The first story is about a man named Ira. He gets into a wreck on a snowy night and starts hallucinating his wife, who died 9 years ago. They start recapping their “Longest Ride” together. There love story came to be in the 1900’s around World War 2, making for some tough times and some beautifully romantic times. The other story is about young Sophia and Luke. Sophia is in college and Luke rides bulls. They meet at a rodeo and their totally different worlds collide. They soon start a relationship that is different than any other they’ve had. I loved this book because I love romance novels. I recommend it if you love sappy romance.